When it comes to automation solutions, there are two wishes at the top of every company’s list: An increase in productivity and less strenuous work for the employees. 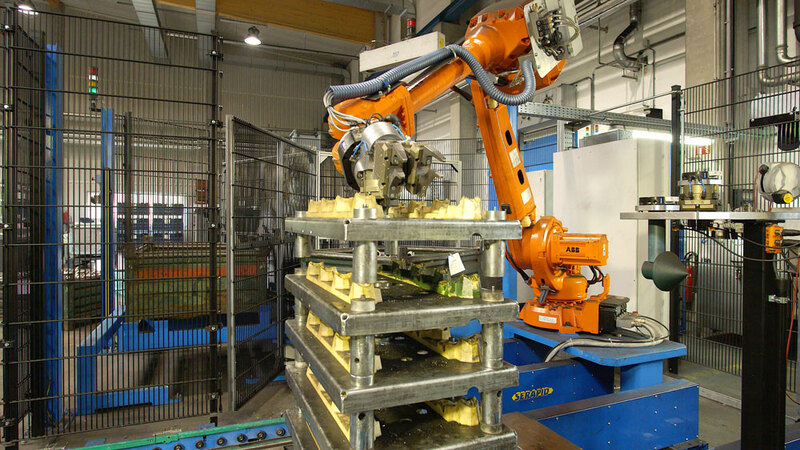 Georg Fischer in Herzogenburg (Austria) has put both into practice – the versatile PLB robot guidance system from SICK facilitates a robot to overtake the heavy duty work, and thanks to the speed of PLB, also does this in a highly efficient manner. Identifying, gripping, picking – this is how fast and reliable bin-picking is done. Randomly oriented metallic parts in a box – locating them in a fast and reliable manner is the task set the PLB system from SICK. Inventors, model builders and home improvers are familiar with the following: One is looking for a certain part or tool – either in a more or less chaotic arrangement on the workbench, on shelves or in cupboards, which somehow seem to be connected to a hidden dimension. Sometimes, things seem to disappear into thin air. “Desk jockeys” who have to search for and find important documents between other sheets of paper know what we are talking about. And when one does finally find what one was looking for, the following sentence might have been uttered at some time or other: “Keeping things tidy is for dummies. The genius, however, is able to master chaos.” In an automated facility for the handling of heavy exhaust manifolds at Georg Fischer, this genius is called PLB – the robot guidance system from SICK. 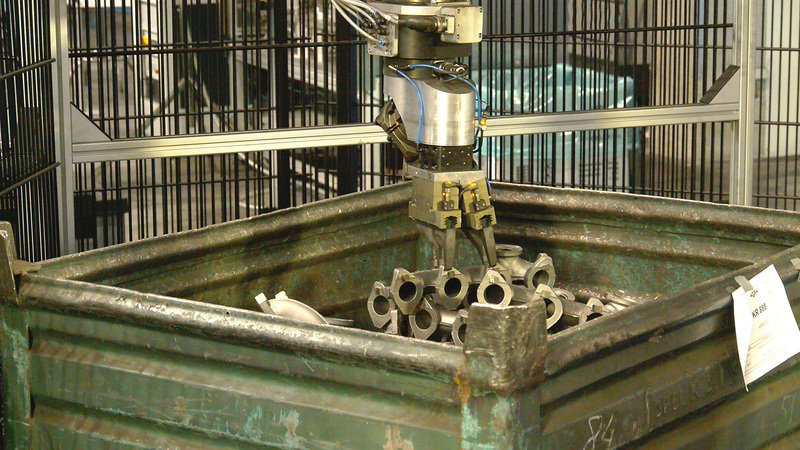 When it comes to depositing parts on the trolley, the PLB system guides the robot. 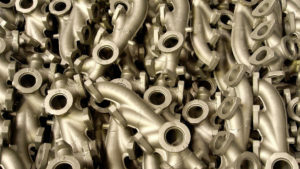 Georg Fischer (GF) is among the world’s leading suppliers of cast iron and cast light metal parts for the engine, the chassis as well as the body of commercial and passenger vehicles. This requires more than just dexterity – for the handling of exhaust manifolds, the company from Herzogenburg relies on the PLB robot guidance system from SICK. 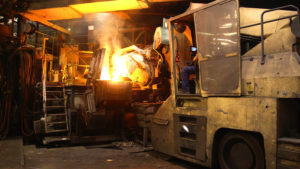 The task at GF: The manifolds must be picked from a bin and placed on a trolley – a monotonous and taxing duty, as the parts would have to otherwise be moved manually. 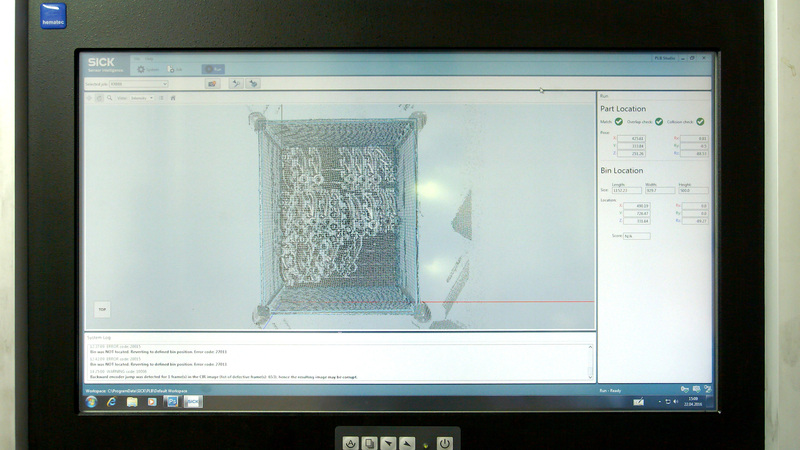 The challenge: The cast parts are randomly oriented in the boxes, which makes reliable identification and accurate localization a must for automated picking – which is not a problem for the precision work of the PLB system. Developed for the exact determination of the position of components in bins and boxes, the PLB system is especially used for applications in which parts need to be localized and individually entered into the production processes. As is the case, for example, in the handling of both unfinished and completed cast parts or forgings. These are often transported between processing stops in collective bins. And in the course of the assembly processes, “picking the bin” is also sometimes indispensable – for example when parts and/or components are to be removed from material boxes or palettes. The conditions in the casting house are best described as harsh – the molten metal is turned into exhaust manifolds. The CAD-based “teach-in” of new parts in the PLB system allows for a simple configuration in the event of new applications, guarantees short calculation time and ensures a high throughput. The system comprises a 3D camera (ScanningRuler), part localization software as well as helpful tools for simple robot integration and communication with a higher-level control system. The specifically designed camera provides exact 3D images and is impervious to the influence of artificial lighting conditions. Tested and proven tools and functions for, the alignment of the PLB system with the robot coordinates system, the communication with the robot, as well as verification of the collision-free positioning of the robot gripper allow for a speedy integration of the system into production. All hardware and software components are delivered prepared for immediate utilization. The camera, which features an integrated laser light source, allows for millimeter-precise 3D point cloud measurements. The camera also provides 3D images for easy performance monitoring by the user. The functionalities of conventional machine vision systems are often not sufficient for robot guidance. 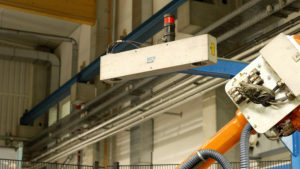 Such systems, for example, lack functions for the alignment of coordinates with the robot or for the identification of collisions during positioning of the gripper in the bin. Furthermore, new applications frequently require a significant amount of programming, which rapidly results in an increase of required time and application development. The PLB system from SICK is the remedy. It offers all the tools required for robot integration and features 3D image recognition optimized for the identification of metal surfaces – which is perfect in order to increase the level of automation in parts handling, at GF in their application, in no time at all. The ScanningRuler from SICK provides precise and reliable 3D measurements of stationary objects – ideal for the utilization of robot-assisted bin-picking applications. At the trade fair “Automatica” in Munich, the persons in charge at Georg Fischer were looking for possible solutions to their specific task at hand, they repeatedly encountered the ScanningRuler from SICK as a component utilized by different suppliers and integrators. The camera also forms the core of the PLB system. The ScanningRuler provides precise and reliable 3D measurements of stationary objects. This makes it the ideal camera for 3D image processing in robot-assisted bin-picking. The collected data can be used to localize parts or to compute the best gripping position for robots. The camera, which features an integrated laser light source, allows for millimeter-precise 3D point cloud measurements across the entire range of the image, even under the influence of interfering light sources. Connection between the rugged Scannning Ruler and PC is done using industry proven Ethernet connectivity. The PLB system ensures computation of the robot’s optimal gripping position. Peter Friewald, Automation Specialist at GF: “We have found that the identification of complex metallic contours – such as those of exhaust manifolds – is a scenario that many suppliers of vision solutions have problems with. The 3D image recognition of the PLB system, which is optimized to identify metal surfaces and contours, on the other hand, convinced us right from the start. Format changes can also be carried out in a simple manner. At present, five different types of parts are being processed with the system.” In order to simplify the configuration, Peter Friewald has created an individually designed graphic user interface on the basis of the standard program, which optimally meets the requirements of GF.